The City of Palm Bay provides its residents and businesses with opportunities to enhance the quality of their lives while living and working in an affordable and safe environment. 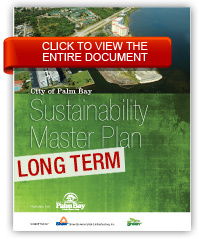 One of its ultimate goals, “sustainable growth” is an inherent characteristic of Palm Bay as stated in its motto, “A Perfect Place to Grow.” In an effort to build good places for people to live and to be good environmental stewards, Palm Bay is inspired to be a sustainable community and to lead by example. The City of Palm Bay initiated and continued several actions to demonstrate the City's commitment to sustainable growth. The City's development plan is based on the principals of stewardship of natural resources, economic health and quality of life for residents. The City of Palm Bay earned certification under the Florida Green Building Coalition's Green Local Government Standard, which recognizes cities for outstanding environmental stewardship. Palm Bay was awarded certification after it demonstrated the implementation of practices that reduce environmental impacts. In 2009, (the first full year of a certified ISO Environmental Management System (EMS) for the Utilities Department), the electrical usage for water treatment was reduced 31% from 2007 baseline values. Additional practices adopted by the City included the use of green cleaning and maintenance practices and Light Emitting Diode (LED) technology in traffic signals. Also in 2009, as part of the City's Energy Efficiency and Conservation Block Grant (EECBG) program, the City developed an Energy Efficiency and Conservation Strategy (EECS) and a sustainability master plan. Become a sustainability leader and lead by example. The City of Palm Bay has prepared this GHG emission inventory to assist in meeting the goals of the energy strategy and sustainability plan. This report contains the results of the GHG inventory for municipal operations for calendar year 2009. The GHG inventory was developed following guidance provided by the Local Government Operations Protocol (LGOP), Version 1.1. The LGOP was developed in partnership with the California Air Resources Board, The California Climate Action Registry, ICLEI- Local Governments for Sustainability and The Climate Registry.